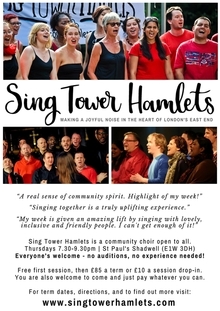 Sing Tower Hamlets is a community choir open to all regardless of experience! 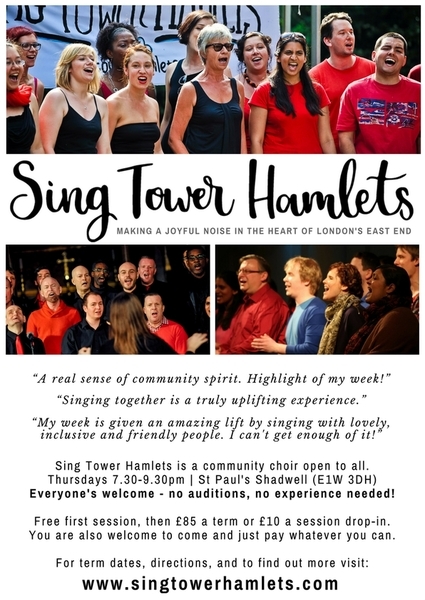 If you love to sing, then Sing Tower Hamlets is for you. The emphasis is on bringing local people together to sing in a friendly and informal environment, and to make a joyful noise in the heart of the east end. We meet on Thursday evenings (7.30-9.30pm) during term time at St Paul's Shadwell (302 The Highway, London, E1W 3DH), and sing in a range of styles. There are no auditions, and songs are taught by ear, so you don't need to be able to read music. Whether you're a seasoned performer or a nursery-rhyme-crooner, a karaoke king or a save-it-for-the-shower type, you are welcome to come along! Your first session is FREE, and after that you can pay on a termly or sessional basis. For more information on dates, cost, directions etc, see the website!